Ferrari F40 by LEGO is a Go-Go! Engineered by LEGO designer Michael Psiaki, who studied the 134-page owner's manual, the new set immortalises a now highly sought-after classic which was produced between 1987 and 1992 to celebrate the Prancing Horse's 40th anniversary. One of the most desirable and fastest cars of the era was also the last ever vehicle to be signed off by Enzo Ferrari, the founder of the Italian marque. Made from 1,158 pieces, the LEGO replica is a 1:15 scale model of its original namesake, measuring 27cm long, 14cm wide, and standing at 8cm high. The racing red exterior follows the shape of the famous sleek aerodynamic 11-section kevlar body conceived by coachbuilder Pininfarina in the 1980s. Just like its road-going equivalent, the LEGO edition features side air intakes and a working lift-up bonnet with triangular air inlets which provides access to the luggage compartment, tools, and even a can of tyre sealant. The F40's signature pop-up headlights can also be moved up and down while at the rear, the vented hatch and large spoiler can be raised to take a closer look at the intricate 471hp twin-turbocharged, 2.9-litre 90-degree V8 engine - which comes complete with a quick-release mechanism for fast removal. Tailor-made rim inserts with like-for-like eight-sided wheel nuts, and 'road-going' tyres, finish the authentic look. The LEGO designer's attention to detail continues with the interior. Opening the hinged driver and passenger doors reveals cabled door handles, two red racing seats and a steering wheel adorned with the world-famous Ferrari logo. 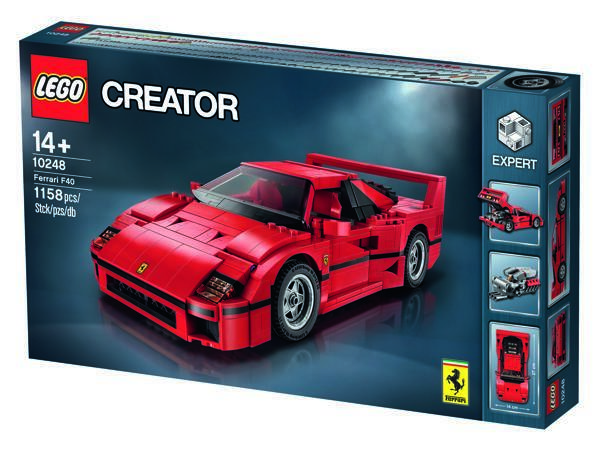 Available now, the LEGO Ferrari F40 is priced at £69.99 (RRP).